Profile: Learned chiefly jurisprudence in the faculty of law of Tokyo University. Later, thought deeply over and developed original philosophy & theology, and devoted himself to writing activity mainly in jurisprudence. Drafted Mouseion project in 1999, and strived for realization of it, and engaging in this business at present. He is a central brain of this site, and takes charge of judicial affairs in Mouseion from his much experienced practical business. Tasks in his charge: Writing “Thinking on Space Art” & ”The World of Teruo Sato”, and translating them into English. Laying-out and designing index & each page of “Thinking on Space Art”, ” The World of Teruo Sato” & “About Mouseion”, and creating original plan of the top image of Mouseion site. Profile: Learned the Buddhism in the university but quitted it before graduation.After that, graduated from a drama school. From 1982 to 2002 worked as an exclusive model of painter Teruo Sato who is first took up in this site while learned a flamenco and Hawaiian hula. Participated in the Mouseion project in 1999 and now serves as a representative of it with Taketoshi Murayama. 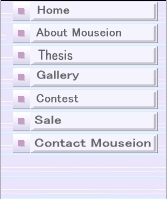 Tasks in her charge: General laying-out & designing all of the Mouseion site, and designing "Thinking on Space Art Index-Pade, and special laying-out & designing the page of Teruo Sato’s Gallery. Producing each planning for Mouseion site and doing business of it. Interviewing to Teruo Sato for preparation of writing of ”The World of Teruo Sato”. Profile& Tasks in his charge: From August 2000, took charge of all photography of works of Teruo Sato in his last years. Being good at scenery photo, in the Photo contest in Japan, gloried in winning a prize several times. Also, being scheduled to take charge of writing outline version of ”The World of Teruo Sato” in Japanese. Whoever wants to make contact with each staff might offer its request to this site. Specializing in following translations: From Japanese to English, From English to Japanese, From Japanese to Greek, From Greek to Japanese, From English to Greek, From Greek to English. Specializing in following translations: From Japanese to Portuguese, From Portuguese to Japanese, From English to Japanese, From Portuguese to English. Her past Works: Translating the preface of ”The World of Teruo Sato”. Rewriting the original translation of the technique part of ”The World of Teruo Sato”.